Growing succulents is a fascinating hooby, so satisfying that you never really end learning about them. Succulents come from different regions and they differ in cultural requirements. Some are hardy to frost, but others are so delicate that many efforts are needed to maintain them in cultivation. But this is the challenge and make this task more stimulating. Add some plant-nutritious substance to supply mineral nutrients. ( Whichever medium is chosen, it should be sterile) . Transplant succulents at the beginning of their growing season and not during their rest period. Plants should be transplanted in a fresh soil mixture every 3 to 4 years. A larger pot may be not necesary, small pots dry out faster than large ones, a small plant grows better in a small pot. Before plants are transplanted all old, dead roots and injured parts must be cut away with a sharp knife or cutter, and place them in the shade for 7-21 days to dry out before they are planted. Succulents can be grown in a variety of containers. Pottery containers are very porous and let the soil dry out quickly, in full sun they may scorch. Plastic pots remain moisture longer, and the danger then becomes waterlogging, clear drainage and a porous compost are essential. Never plant a plant in a container without a drainage hole. To add a top dressing around the base of the plant also improves the drainage in a pot. Light-coloured gravel reflects heat and keeps the roots a bit cooler on a very hot day. After planting, keep the plant in semi-shade at first and as soon as it shows signs of growth can gradually be placed in full sun. Succulents need regular watering while growth is taking place, but wait until the soil in which it grows has dried out completely. 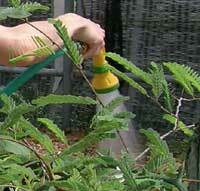 When the leaves or body of a healthy plant start wrinkling or shrinking, it can be watered again. Always water well until the water starts running from the drainage holes. Waterings will depend on where the plants are placed, how much sun they get and the type of soil in which they grow. Read the messages, if there is some sign that show you the plant want to rest ease off watering. Remember that some succulents are winter growers as others are summer growers. If a plant tells you that it wants to grow in winter, the most you can do is to give it all the light possible and warm. A glasshouse is, naturally, ideal for succulents in cooler countries, but many can be accomadate in patios or on south-facing window-sills.The ideal growing temperatures for most succulents occur during fall and spring, when days are warm and nights slightly cold. For many succulents 5ºC minimum temperature is safe and even some resist a short period of temperatures below 0ºC if kept completely dry.